I present to you, for the third time (!) HMS Victory, Nelson's flagship, inventor of Blacktron colours ? In case you're wondering, it's my warship moc for Decisive Action, equipped for modern naval warfare, sort of. Regular viewers may be getting deja vu - but this one's half the size of my DA1 warship and microscopic compared to the one on my home page. What can I tell you, it's my favourite boat! A detachable separate hull, for when it's out of the water. Brilliant. Just Brilliant. I'm a huge fan of Naval History and absolutely love the HMS Victory, and you have done a marvelous job at capturing her iconic appearance at such a small scale. I eagerly await the day when I will step on her decks for myself. Sorry for being late, Nick. A lot of work this summer. What impressed me first is both way to present her: sailing or as a desk model, lines are pure and fluid. Then the sails, terrific part use that beautifully served the silhouette. At last, the mix with black and yellow pieces is very balanced. Modified 1x1 bricks and cheese slopes are used perfectly. Yes, you should keep it for a long while. It's tinier than I thought! Nice work with the cute sails and mini windows. A minifigure would be really shrunk to fit in there! Wow! Love the classic look to this. Amazing microship! I really like the way you used cheese slopes to simulate the cannon doors on the sides. Great work! Nice work. I like how you have the attachable hull for the stand. Wow! The amount of unique angles that you've packed in is astounding! Definitely a great build! Very smooth ship! Such a good design too! This ship is definitely a great victory! Haha! ;-P Good luck during DA! Another great work of Lego "Ship" creationism! I second all of the great comments! Amazing ship! I like the sails. Great work! THIS IS AMAZING! The shaping of the hull is magnificent! I love how you made the bow. Very clever piece choice for the sails. I also love that like the DA version you can make it a waterline model. Sail on to Victory! I almost did a double-take there, great scaling, as said previously, excellent work on the sails! Looking forward to your next turn, Destroyer!!! This is an incredible microscale ship! Wow, so good! Beautiful work on this ship. I really like all the angles of it. Awesome job with the sails and rigging! that looks really nice! the little details are sweet NIck! Absolutely awesome. A historic ship, superbly realised - again! I hope that you get to keep this one for display, as you say! 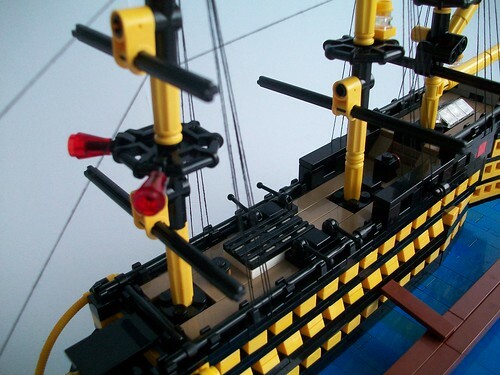 another epic build from a LEGO seaborne master craftsman. 100/100. BOAJEWD. Little victory, but big details! Great mini rendition of a wonderful build. I love this little ship, almost as much as the big one. You've done an amazing job representing all of the important details and matching the hull shape at this much-reduced scale (it appears to be roughly 1:200, which has now become my scale of choice for naval models -- is that right?). The sails are indeed brilliant, and who knew that Teach invented Blacktron? General, you are specifications-accurate and ready to rule the waves of DA2. Good luck on turn 6! Pretty crafty there, Dude! I like the removable hull. Some days on display, others, off to sink some Frenchmen. Awesome! Nice! It seems even the sailors of [that time period] recognized the awesomeness of Blacktron colors. May it serve ye well! Whoa! What a great way to combine old and new technology! Great work and good luck! A new way to assert your mastery of technic pieces. Great job Nick! I agree with Henrik about the Technic pieces, they are a stroke of genius. What a great name for this amazing build! It is indeed a Little Victory to make a ship so beautiful and brilliantly detailed at such a small scale. The Technic panels used for sails are truly a stroke of Genius. Excellent Work! Wow!, big was my surprise as I discovered your piece usage for the sails, never I would have guessed how small the ship is, without those. Also, those sails are one of the best brick usages ever shown, brilliant, just brilliant! Brilliant, with echoes of your big Victory. I like the cheeses as gun ports and the Technic panels as sails. WOW this is awesome warship! I like that you made brick-build base, it looks very nice. Oops... a diplomatic faux pas, that. Thanks Tom! Quoting Sean B Fantastic build. I remember your other one from the last DA, (was that version 2?). As a fellow Brit, I assume that you've been onboard the original? I think they may not let people on any more. Fantastic build. I remember your other one from the last DA, (was that version 2?). As a fellow Brit, I assume that you've been onboard the original? I think they may not let people on any more. Quoting Tom Simon I love those sails! Lovely all around. I assume this model includes a force field to protect against French sniper shots. It was very hard modeling challenge, you did more than anyone could. Fantastic, I love the technic sails at this scale. A wonderful display piece. Oh oh! Whoa, that's all technic! Looks so cool; congratulations! I love those sails! Lovely all around. I assume this model includes a force field to protect against French sniper shots. Really impressive. Your ability to get a sense of scale at any size is excellent. The detachable hull is brilliant! Beautiful downsized version of this majestic build! So great nick! I absolutely love the scale you built this in, just wonderful! The modern weaponry is a super bonus! Oh, a beautiful ship. I like the gun ranks, the sails and rigging. And ähhhh the laser cannons. Quoting Kris Smith love it, Being from Portsmouth way I know the ship well. love it, Being from Portsmouth way I know the ship well. Quoting Matt Bace I love this little ship, almost as much as the big one. You've done an amazing job representing all of the important details and matching the hull shape at this much-reduced scale (it appears to be roughly 1:200, which has now become my scale of choice for naval models -- is that right? ).